Real Madrid have signed midfielder Mateo Kovacic from Inter Milan for an undisclosed fee. The 21-year-old Croatia international has signed a six-year contract at the Bernabeu, where he will be presented to the Real fans on Wednesday. 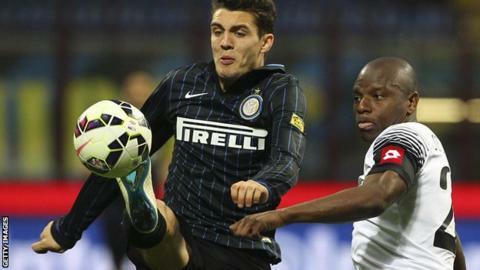 Kovacic scored eight goals and provided 11 assists in 97 games for Inter, whom he joined from Dinamo Zagreb in 2013. Real, who finished second behind Barcelona in La Liga last season, begin the new campaign on Sunday. Rafael Benitez's side play at Sporting Gijon in a 19:30 BST kick-off. Kovacic, who has played 21 times for his country, will join countryman Luka Modric at the club.